I'm designing a battery supply to go into a bluetooth speaker. Having never worked with Li-ion cells before, I've done some research and understand that they need to be load balanced and protected from over-voltage or they explode. 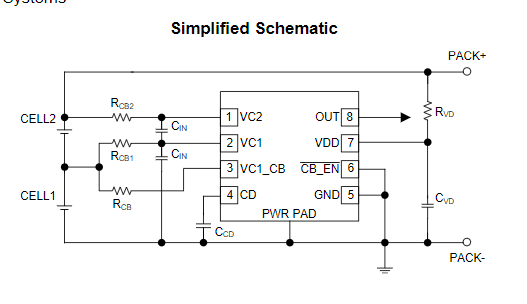 Am I correct in thinking that building this circuit should be enough or is additional protection required? My design must be able to output 5V and 1A. I'd also appreciate it if someone could clarify if PACK+/- are the two power terminals and if OUT is the PSU output voltage? The bq2920x IC is a smart battery fuel gauge chip useful for longevity of the battery but does not offer any safety features, per se. The Typical App does show some protection for current flow direction with a dual FET which can be purchased.